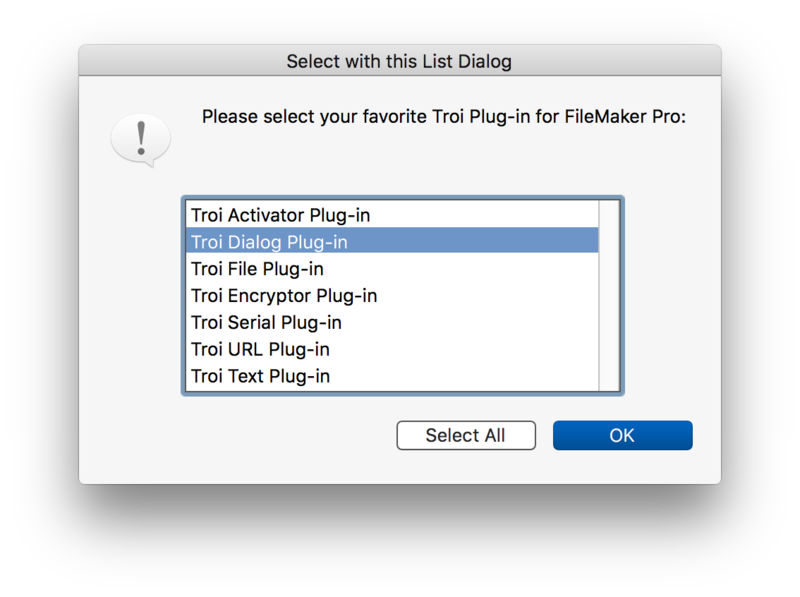 Troi Dialog Plug-in is a very powerful tool for displaying all sorts of dialogs in FileMaker Pro. The text of the dialog and of the buttons can be created dynamically by using a calculation. With the Dialog plug-in you can calculate the text and the buttons of your dialog box in a script. You can add data from fields or variables and also change the labels of the buttons. This enables you to give database users more detailed information, including text from fields or variables. Show a dialog with up to fifteen input fields, where the user can type text or a password (no need for a special bullet font to be installed! ), choose an item from a pop-up list or mark a checkbox. All input fields can be filled with pre-entered values and you can specify in which field the input dialog will start. Popups in the input dialog can display values from a second value list. The selected value from the first value list is returned. You can use this for example with a list of ItemIDs and a list of ItemDescriptions. The descriptions are shown to the user, while the ID is returned. With Troi Dialog plug-in you can display a big input dialog box, in which the user can type (or edit) long pieces of text. You can specify how many characters the user needs to type before buttons are activated and also the maximum number of characters allowed. You can also prefill the text, set the size of the window, choose the title for the dialog and give it a standard icon or your own icon. We added support for using several keyboard shortcuts in the edit fields of the InputDialog and BigInputDialog functions. On macOS you can use undo (command-z), redo (command-shift-z), copy (command-c), paste (command-v), cut (command-x) and select all (command-a). On Windows you can use undo (control-z), copy (control-c), paste (control-v) and cut (control-x). With Troi Dialog plug-in you can display a list dialog box, from which the user can choose an item. Note that the OK button is disabled until the user chooses an item. The list dialog box is completely customizable, including setting icons. Using the switch -AllowMultipleSelection in the ListDialog function will allow the user to select multiple items from the list. Command-a (macOS) or control-a (Windows) can be used to select all items. The selected items are returned separated by the pipe character. You can also preselect multiple items. We’ve added functions to make it easier to put the data entered and the number of the button clicked by a user into separate fields: ready for further use! With Troi Dialog plug-in you can show a flash dialog that will stay visible only for a fixed amount of time, for example 4 seconds. Great to give extra instructions to a user, without the user having to dismiss the dialog. For lengthy operations you can show a progress bar. Troi Dialog Plug-in lets you display a (local) notification on screen (and in the notification center), even when FileMaker is in the background or not running. This way your user can work in a different application and be notified for example when his report his ready. You can also choose to have a script triggered when the user clicks the notification, for example taking him to a specific layout. You can state precisely where you want the dialog box to appear on the screen. The plug-in will make sure the dialog remains visible even if your coordinates are outside the screen’s reach. Giving your solution that extra quality! You can add a standard icon or your own icons, in standard size or extra large. Custom icons from a PNG image, including transparency, are supported. You are free and invited to test the plug-in before you pay. Troi Dialog Plug-in is fully functional in demo mode, it will only stop working after 5 hours of testing. Download your copy here. 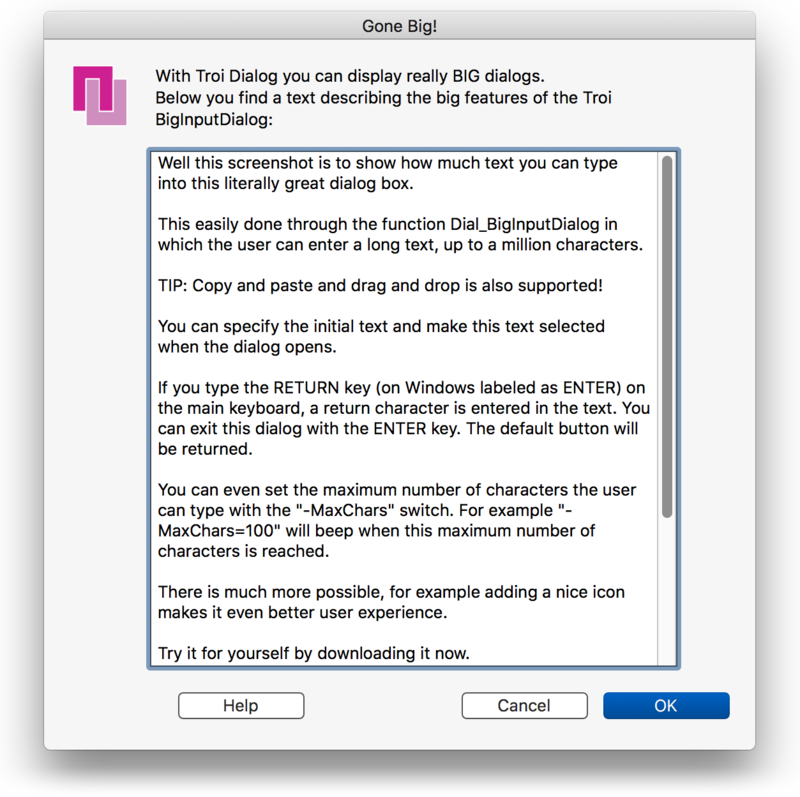 Troi Dialog Plug-in 7.5.1 is a bug fix release. Troi Dialog 7.5 was a major release which added compatibility with FileMaker 17. New functionality added in version 7.5 is the possibility to schedule the display of a (local) notification on screen (and in the notification center). You can add an action button and set a script to be triggered when the user interacts with the notification. You can also remove a (delivered) notification with a script. In this version we also added a new Show List Dialog script step, which shows a dialog with a list of items for the user to choose from. To demonstrate the new functionality, we added a new Notifications.fmp12 example to the download and we updated the ListDialog.fmp12 example file to show how to use the new external script step with FileMaker 16 and 17. (Windows) Fixed a problem where the plug-in would not be loaded on Windows 7. Note that the notification function Dial_ScheduleNotification and script step “Schedule Notification” are not available on Windows 7. In this case the plug-in returns with error code $$-4243 (kErrNotImplemented). (Windows) Fixed a problem for FileMaker Pro 14 and FileMaker Pro 15 where the FileMaker window could loose focus after showing a dialog. (macOS) Modernized the code dealing with custom icons in the (deprecated) PICT format. Added a new Schedule Notification script step, which schedules the display of a (local) notification on screen (and in the notification center). Added a new Remove Notification script step, which removes a (delivered) notification. Added a new Dial_ScheduleNotification function, which schedules the display of a (local) notification on screen (and in the notification center). Added a new Dial_RemoveNotification function, which removes a (delivered) notification. Added a new Show List Dialog script step, which shows a dialog with a list of items. (Windows) Added code signing to the plug-in for Windows. (Windows) Improved several dialogs, so that they always stay in front. When you click on another (FileMaker) window those windows will no lo longer get in front of a dialog of the plug-in. (macOS) Fixed a problem with the Dial_FlashDialog function, where the custom dialog position would not be used. Added new Notifications.fmp12 example file and updated the example files for FileMaker Pro Advanced 17. (macOS) The minimum supported Mac OS X version is now OS X 10.10 (Yosemite). (Windows) The minimum supported Windows version is now Windows 8. Tested and improved compatibility with Windows 10 (Creators Update) and macOS 10.13 (High Sierra). Rewrote the code in several places. The plug-in now has a demo test time of 5 hours. 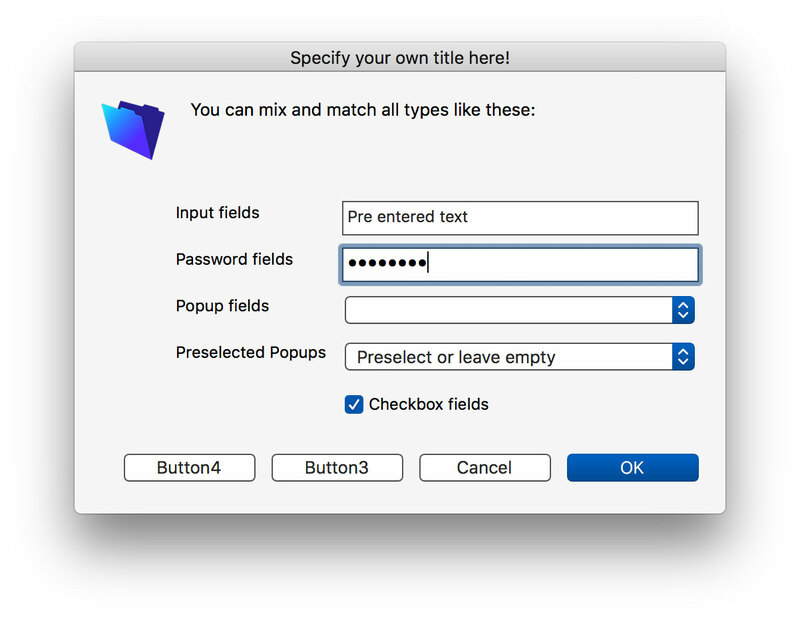 You can continue to test the plug-in after a restart of FileMaker Pro. The Dialog Plug-in adds script steps when running FileMaker Pro 16. NOTE Only steps that perform an action have been added as a script step. Functions that have no side effect (like for example Dial_GetButtons) are only available as an external function. Added new scripts to the BigInputDialog.fmp12, Flash.fmp12 and PresentImage.fmp12 example files, to demonstrate how to use the new external script steps of FileMaker Pro 16. The examples check if FileMaker Pro 16 is running and will then select these new scripts. (Mac OS) Updated Dial_PresentImage function for 64-bit: this function can now show a fullscreen slide show of images and movies. Fixed a problem in the Dial_ListDialog function: when you specified that a selection is required, you can no longer exit the dialog by double clicking on an empty line. Added switch to the Dial_ListDialog function: “-ExtraLineHeight=x”, where you can specify extra height (in pixels) for each list item. (Windows) Improved the Dial_ListDialog function: list items should have more vertical height when using hi-resolution displays. Updated the code in several places and added improved namespace handling to make the plug-in more robust. (Mac OS X) Improved export of symbols of the compiled plug-in: now only the symbols that are required are exported. (Mac OS X, 32-bit only) Fixed a possible interference with other plug-ins, during the registration phase. Fixed a bug in the code for registering the plug-in. The type-ahead information is used by the auto complete functionality of FileMaker Pro 15. In the calculation pane of the Specify Calculation dialog box you can type a letter or two of the function name and instantly see a list of matching function names. For example when you type “li”, the auto complete functionality will suggest the Dial_ListDialog function. You can also type a function name in the functions pane on the right: for example if you type “dial” you will see all the functions relevant to dialogs, like Dial_BigInputDialog. If you have a license for a previous version, you can buy an upgrade for version 7.5. If you bought a license for version 7.0 on or after October 23, 2017, the upgrade to version 7.5 is FREE! Note: eligible users have been sent a new 7.5 registration. Contact us if you have not received yours. We are still collecting more comments. If you have any remarks on the Dialog Plug-in please send us your comments. Thanks! How to display an input dialog with a popup, which displays the values of a second value list, while returning the chosen value from the first list. (Older) information on how to convert databases which use Troi Dialog, from FileMaker Pro 6 to FileMaker Pro 7 and later. Give your database that extra quality by giving users the best feedback!